We were just enjoying a quiet afternoon when out of the blue we got a hankering for something chocolate-y. A quick rustle through the cupboard came up empty. And, the freezer held no left-over-from-summer chocolate dipped ice cream bars either. So I grabbed a small handful of shelled pecans, thinking that might curb the urge, and returned to my lounging position in our sunny bedroom where I'd been reading A Light in the Window by Jan Karon. You probably won't be surprised to learn that...no...the pecans in that unadorned state did not curb anything. You probably won't be surprised either to learn that we flung back the cozy cover, laid down the book, and went in search of the easy Hot Fudge Sauce recipe a friend gave me years ago. 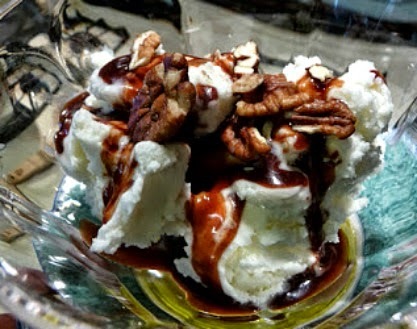 Five or six minutes later I had vanilla yogurt ice cream scooped into a bowl... poured some hot fudge sauce over top... added a sprinkling of pecans... and grabbed a spoon. Ahhhhh... much better! Brenda, I have so often done exactly the same thing! I love the Jan Karon books too. That chocolate sure does add a nice finishing touch! 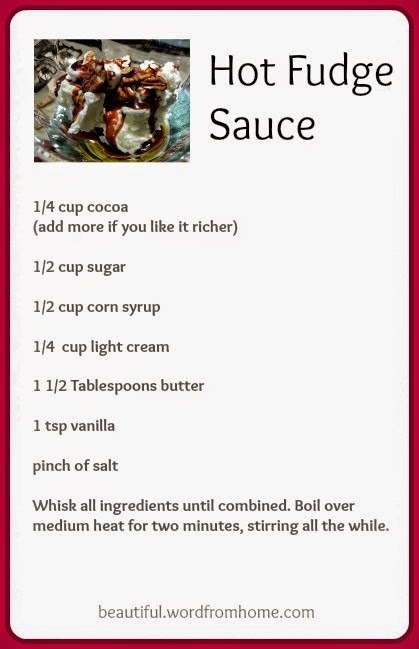 Going to try the recipe! Debi, I've eaten it that way too.... it is yummy, although I find it awfully sweet so it's a small spoonful! And, I will try that recipe. Thank you. Oh yum! I just finished nibbling on a piece of dark chocolate while reading blogs. There's something that only chocolate will satisfy. Oh Brenda - that is a recipe I am going to have to add to my file...looks fabulous - Pecans always need ice cream and hot fudge sauce. Hope you are having a lovely day.